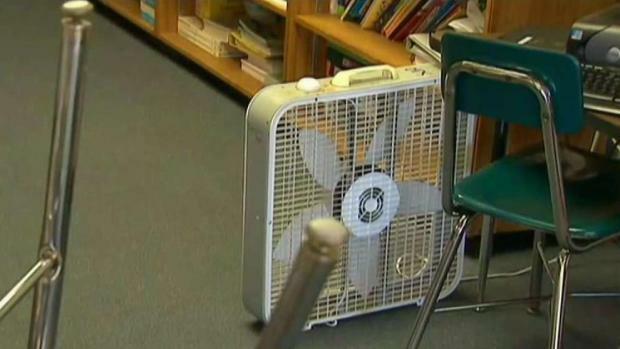 Hot weather stoked a long-simmering political dispute in Maryland over a lack of air conditioning in Baltimore and Baltimore County schools, as the heat continued to interfere with school hours on Wednesday. The issue boiled over again at a meeting of the Board of Public Works, where board members who have highlighted the problem for years spent much of the meeting discussing it. Comptroller Peter Franchot and Gov. Larry Hogan, two of three board members, accused leading lawmakers of playing politics and failing to resolve an issue they say has affected more than 44,000 students this week. Franchot, a Democrat who has long clashed with the leading Democrats who control the legislature, pointedly criticized top leadership with less than nine weeks left before Election Day, when all state legislative seats are on the ballot. Franchot cited "simple political retribution'' and "the bosses downstairs,'' when referring to House Speaker Michael Busch and Senate President Thomas V. Mike Miller, whose offices declined to comment Wednesday after the meeting. "We're talking about a tiny group of people who have had power so long that they no longer recognize it when they abuse that authority,'' Franchot said, adding that previous efforts by the board to address the matter have been blocked by legislative leaders. Prince George's County Public Schools closed early Thursday due to the extreme heat. County Bureau Chief Tracee Wilkins reports some schools' air conditioning systems aren't working properly. The issue has been as hot as the weather in Annapolis. The General Assembly voted this year to strip the board's authority over school construction funding and put it in the hands of a commission. Hogan vetoed the bill, but lawmakers overrode his veto. "I think that there will be plenty of time in the future to talk seriously about our schools, about school construction issues, about funding and about education, which would be a good thing, preferably after the campaign season is over,'' Kopp, who is elected to her position by the legislature, said. Hogan, a Republican, criticized the treasurer for insinuating the matter was all about politics. Ben Jealous, a Democrat who is challenging Hogan in November, appeared with teachers in Prince George's County in front of Laurel High School, where students were getting out of school two hours early because of heat above 90 degrees. Jealous criticized the governor for not investing more in education infrastructure. He said Maryland children have been let down for too long. "They get shortchanged today, and the economy gets shortchanged tomorrow,'' Jealous said. A separate state panel is working on recommendations to upstate school funding formulas, which haven't been updated in nearly two decades.